Lots going on this fall in visual arts, starting this week. Eight openings this Friday, September 14, including one in two parts, at CEPA and WNYBAC, on a technological innovation affecting artistic production and distribution from the 1960s to the present, the copy machine. The CEPA show to feature more than 100 artists over six decades who explored use of the copy machine to create and produce and disseminate artworks quickly and inexpensively. CEPA covering the photography and such part of the joint effort, WNYBAC the specifically books part. The title of the joint exhibit is Fast, Cheap, and Easy: The Copy Art Revolution. 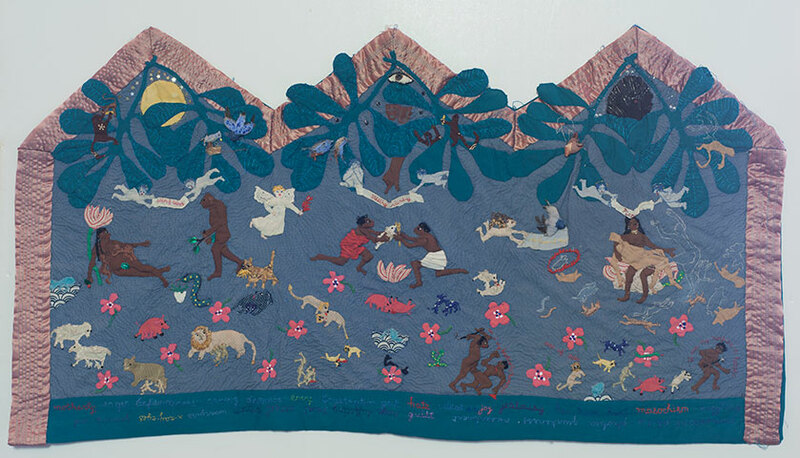 Also opening the same night at WNYBAC, an exhibit called Embroidered, consisting of fabric and needlework by Debra Eck. Other September 14 openings include one at Squeaky Wheel called The North Is a Lie, regarding “the people and communities that have suffered the most at the hands of the Northern myth,” starting out with acknowledging that “the land we stand on is stolen land—this was and is Haudenosaunee territory.” At the Burchfield Penney, a show entitled Salvaged: The Stitched Narratives of Jennifer Regan, showcases the work of the locally well-known visual artist and poet. At Hallwalls, minimalist sculptures of Brooklyn-based artist Fabienne Lasserre, with artist’s talk; at Meibohm Fine Arts, a show called Hounds and Horses, artworks by Constance Payne; and at Indigo, a performance work by Michele Costa of theatrefiguren, three short pieces entitled collectively Inquire Within. The next day—really, evening—September 15, an opening reception for three new shows at the UB Anderson Gallery: one of works by artist Kambui Olujimi called Zulu Time, in a variety of artistic media and approaches from glass blowing to wheat pasting, intended to explore “interlocking systems of power and invisible hierarchies”; one called Implications, sculptural works of Ernesto Burgos said to “exist almost as an affront to gravity,” and one called Collected Views: I Am Here, consisting of landscapes, interiors, and abstractions by various artists—works from the UB collection. On September 21, the East Aurora Fall Art Walk, starting out from the Meibohm Gallery. Also, at Hotel Henry, a six-artist show, by Reed Anderson, Jozef Bajus, Roberley Bell, Julia Bottoms, Lyn Carter, and Biff Henrich. Also, at Starlight, artwork by Emily Churco, Mario and Sherri, and John Budney. Also, at the Nichols School Gallery, a reception in connection with the Nichols show of work by the three artist/entrepreneurs—Rachel Shelton, Mizin Shin, and Bob Fleming—of the new Mirabo printmaking workshop on Botsford Place nearby. The next evening, September 22, at the Anna Kaplan Contemporary gallery on Niagara Street, an artist’s talk by Reed Anderson, in conjunction with his show there called Daybreaker. Another Anna Kaplan, et al., event is the PLAY/GROUND multi-artist site-specific installations extravaganza scheduled to occur in in Medina, New York, October 12-14. For ticket and other information, link to artplaygroundny.com, and read more about this spectacular in a forthcoming edition of The Public. And on October 25, at the gallery on Niagara Street, sculptures and drawings by Roberley Bell, entitled then again. September 28, at Buffalo Arts Studio, exhibits of works by sculptors Kurt Treeby and Jozef Bajus. October 19, at Meibohm Fine Arts, Child’s Play, works by A.J. Fries. (And November 24, Around the Seasons, works by Tanya Zabinski.) Also, at Starlight, works by Mary Louise Wyrick and Michele Miller. October 23, at the Albright-Knox, a show of new works from the collection. 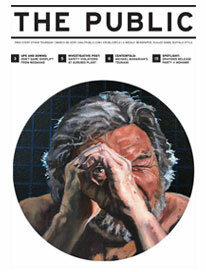 November 2, at Art Dialogue Gallery, three realist artists: John Brach, Thomas Kegler, and Sean Witucki. November 6, at the Benjaman Gallery, works by Wes Olmsted. And November 9, at Hallwalls, an opening and artist’s talk by Guy Richards Smit. As ever, pick up a print copy of The Public on Wednesdays or visit dailypublic.com for detailed coverage of the region’s art galleries, big and small.